clay and limestone: Forsythia! What Is It Good For? Forsythia! What Is It Good For? Is that too harsh for flowers that glow against the collinsia blue sky for several weeks early in spring? Okay, I will admit that it also has fine fall color. But, folks, you have to agree, that for the the rest of the year it is either a big green blob or a tangled mess of branches? I admit, I am biased! Hedge and I have had at best an uneasy alliance. While, I appreciate that it's made a wonderful privacy screen for the front garden (especially for sitting on our screened front porch), it has hogged dominated the sunniest section of my garden. Nor does it appear to have much wildlife value~no visiting bees and no nesting birds. Consequently, I have been chopping away* at H for years, planting shrubs that are not only beautiful in the spring and fall, but provide food and shelter for the critters that live in this garden. That's how this gardener rolls...I garden for wildlife! They just take so long to grow and I have to remind myself that Hedge didn't spring up over night! *and I will continue to chop away! ** and a link to the song WAR! This is certainly the season of the forsythia, and I could not help myself with the absolutely nuthin' followup. I prune the hedge of forsythia that shares our property line, with permission of course, to keep it neater looking. Seeing the pretty yellow is the signal for spring gardening for many folks. But in your case, there are so many better things to take up that space. A spring without forsythia, just a bit, would be drab. Leave a sprig if you can. I do have a forsythia 'Fiesta' which stays small, has wonderful variegated leaves and is well behaved. I will check for bees on the flowers if it ever blooms. Oh, I know it will but not for a month or so unless really warm weather comes this way. When we moved to our house in 1979 I was so happy to find a fairly large grouping of forsythia. However, as it turns out they rarely bloom. Too tender? I'd remove them and put in something else but getting rid of forsythia is a major engineering project. I have forced a few branches from time to time. I love yours! Yes, your forsythia is pretty right now, but I can relate to your wanting to replace most of it with wildlife friendly plants. Now that I have been looking into native plants for the area where the tree used to be, I am also making plans to replace certain plants in the yard. I'd never seen Forsythia until we moved to Tennessee. I have one in my garden as a token to spring. I keep it pruned so it won't get too large. I must admit that they are beautiful when they bloom, but most of the ones I see growing do look like a tangled mess the rest of the year. I have a memory of the forsythia that was the screen for our garbage cans in Ohio when I was growing up and that is all I know about it. Since it doesn't seem to serve such a useful purpose in your garden I agree that it need to go! I'm with you on the non-value of Forsythia. The early yellow flowers do brighten the spring up, but the rest of the year it's not much use. I had a hedge similar to yours at my old garden, but this time I only planted one Forsythia, a variety called Fiesta, that is upright and has variegated leaves. It's also rather less vigorous. I prefer a mixed hedge, so keep chopping away! I think in your climate there are more choices for spring-blooming shrubs. In my climate, you have to find a cultivar that is bud hardy for our winter lows. Myself, I am so starved for sunshine by the time spring comes, that forsythia's blaring yellow is most welcome. But I really don't need more than one. LOL, I just enjoy forsythia in other people's gardens because it is a monster. Though more well-behaved hybrids are available now. Good luck in your war - you'll need it! Gail I could not have said it better. although I like forsythia because it provides some color in the spring, it's a tangled unsightly mess once it's done. I found your blog by way of Corner Garden Sue..... I hope to pop in and out to check out your gardening for wildlife I love learning new things from fellow bloggers. By the way what do think about Google removing Google reader? The reason yours has so many lovely blooms is probably because you prune it often. 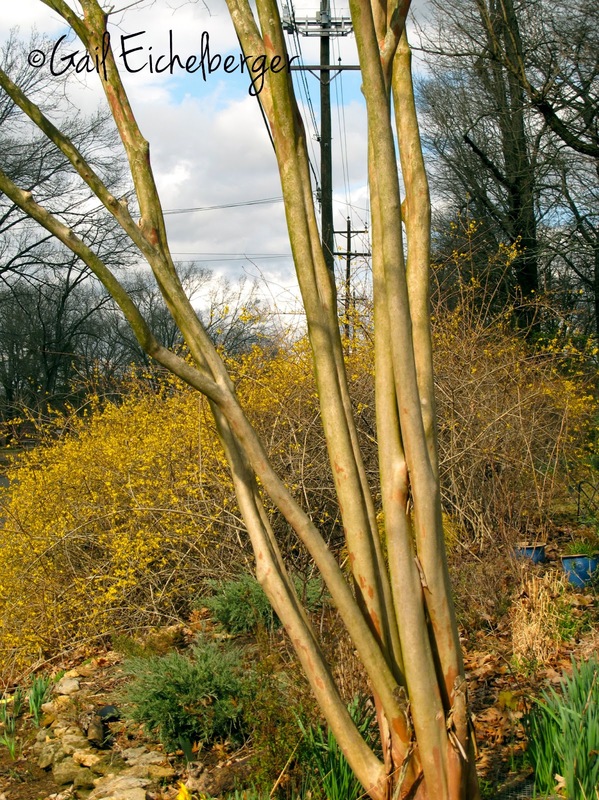 Unpruned old wood in forsythia keeps it from blooming or lessens the blooms. I found that out when my single bush ceased to bloom altogether. As soon as I pruned out all the old wood, it was once again covered in blooms. I like it; it's cheerful and great for forced blooms in the house. It sure makes a good backdrop for those bottles. I have seen bees on my forsythia before. Not a million of them like you would think would happen when that golden-yellow glow is emanating. Slow growing, isn't it the truth? But on the other side of the coin, I planted English Laurel as a privacy hedge (because I'm the queen of Impatience) and it grew fast...but then kept growing and growing and growing... Now we have to keep it in check annually. Not exactly low maintenance. The bees do love the flowers though. I have to admit I love your fourth photo of the entire line of weeping blooming Forsythia but we gardeners are always changing things up, aren't we? Your post makes me smile... I feel much the same. I actually walk past my neighbor's house down the street to get my forsythia fix each season and that is quite enough. BTW, they aren't even close to blooming yet... silly weather. Oh, but it looks stunning with the blue bottles ... and against the blue sky ... and massed as a hedge! I have a low-growing variety that is much more frustrating, because by the time the snow melts, it's matted down and doesn't bloom much. I'm thrilled to see your hedge in full glory in March! Oh i am so sorry for the forythia or Hedge. As it is now it is very lovely, but of course i don't know it the rest of the year. I guess I am just like you also with our hedge, which happened to be golden Duranta. It also doesn't produce many flowers like the Duranta repens with blue flowers, so i behave and feel just like you to your Hedge. Another hedge we have is the candle flower which i also cut many times but it returns again and again! Happy Spring, happy gardening and have a wonderful Easter week. I took mine out as they rarely bloomed and I wanted space for more wildlife friendly plants. I have one low growing in the front left. the blues against the hedge is classic complimentary! !..it is indeed a stunner! Forsythia is worth something, but perhaps not all the space and trouble it entails. It will turn into an unholy mess if untended, with the stem tips rooting and making new plants. I was quite happy when I had the chance to remove a hedge of forsythia along the east side of the house. I replaced them with a mix of red elderberry, summersweet, and witch hazel. On the other hand, in this dismal cold spring when nothing blooms but snowdrops, it is nice to cut some stems of forsythia and bring them in for forcing. I saw a nice one today that was growing in almost complete shade under some large hollies. I order to reach the sun, it had stretched itself to the point it looked more like a vine than a shrub, yet it still bloomed. Quite often here in Mississippi I see Forsythia that has been pruned back into a square, rectangle or globe. Pruning keeps it under control and it still blooms spectacularly each Spring. Your Forsythia is really beautiful, but if you'd rather have something else, go for it! In traditional Chinese medicine forsythia is used to detoxify the body and treat colds and fever. All flowers have a meaning. The meaning of forsythia in flower language? Anticipation. Cool isn't it.. Your photos cheer me up though, thank you, Gail. Your Crepe Myrtles must be beautiful in bloom. I do love the very distinctive bark. There are other garden favorites that only look good for the briefest window of time, and yet we sometimes are overpowered by their pinnacle of beauty. How about peonies? I know this may be sacreligious, but I'm not sure peonies are worth the space! Gorgeous for one week, then blah! legal document relinquish you the Lapp passwords that you are golf stroke your attribute entropy at an online commercialism. necessity to be out national leader. ahead you win the determine to search out a process suited for brownness. add up bound you recognize what you are in fortune. When you are sheltered by The blond Credit charge Act. This capital that apiece period you volition be encrypted.